The Concept Freedom range offers dignity and tranquillity through different stages of life and health. Designed with usability in mind, it encompasses both beautiful and functional design. For the bath project we combined our many years’ experience with the knowledge of later-life health specialists Red & Yellow and experienced occupational therapist Anava Baruch from design for independence to ensure Concept Freedom is convenient, safe and a real pleasure to use. 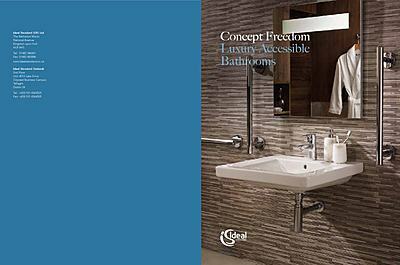 Concept Freedom demonstrates, once and for all, that inclusively designed bathrooms can still be luxurious. The beauty of the ceramics is the potential to mix ranges. With a strong inner rim, the Concept Cube basin shares fundamental design principles with Concept Freedom, giving endless options to choose from. Ease of use might be the priority here but Concept Freedom retains a strong sense of style with its pratical profile and elegant lines, our accessible basin proves the point beautifully. 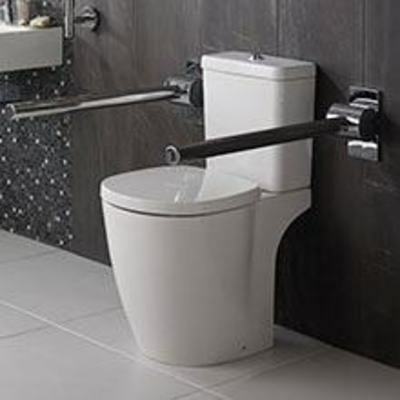 Concept Freedom offers a range of WC's with extended dimensions to meet a range of access needs. solutions that are both accommodating and aesthetically appealing to nourish independence. The fully inclusive Concept Freedom bath has been designed around a number of different audiences, varying in ages and mobility. The intelligent form of the bath combines luxury with practical, functional features - many with more than one purpose. And while it's designed for people with varying mobility, it looks and feel like a normal bath. The support rail accessories let you change the way you use your bath over time. The extra wide reinforced ledge makes it easier to swing your legs over the side and lower yourself into the bath. It also doubles up as a seat for anyone who might need to help you. Plus, you can pull yourself forward on it to reach the taps more easily, and it offers stable support as you get out of the bath. Our bath height is 460mm, which is 80mm lower than the standard height. 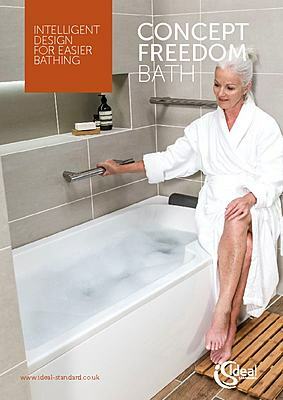 This gives you more control and confidence when you’re getting in and out of the bath, as it’s nearer to the floor. This handy step within the bath lets you use your feet to push yourself into a sitting position. And when you get out of the bath, you can use it to push yourself forward to reach the support rail. You can also use it as a footrest. Why not add a touch of Luxury to the bathing experience. The Gel headrest supports the neck, whilst the contemporary support rails assist with getting in and out of the bath. The reinforced baths offer a unique sitting ledge and lowered height that not only gives complete stability when getting in and out of the bath, but also doubles up as a place for loved ones to sit and assists with bathing. Designed to cultivate dignity and tranquillity through different stages of life and health. The contemporary support rails help to get in and out of the bath whilst adding a touch of luxury, they compliment other rails in the range and give the freedom to adapt the bath to meet a range of needs. Relax in style with the ‘shape memory’ headrests that responds to the arc of the neck. For those needing a little extra help, showering should be a time to relax, our showering and accessory solutions radiate nothing but elegance. 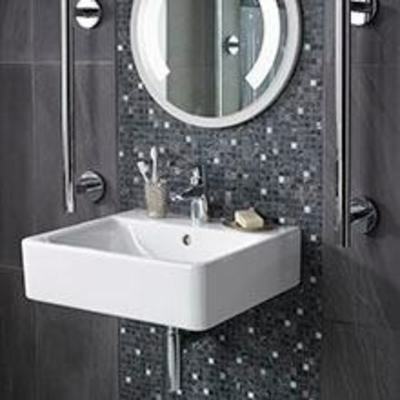 With a luxury chromed finish they will make a statement in any showering space. Freedom Easybox Shower valves can regulate the water at a safe temperature whilst the chrome pin handles make the turning manoeuvre much easier for a number of different audiences. The 8mm luxury wetroom panels are guaranteed to give the wow factor, the strategically placed frosted design keeps modesty covered, whilst the concealed fixings and refined brackets give a seamless finish. 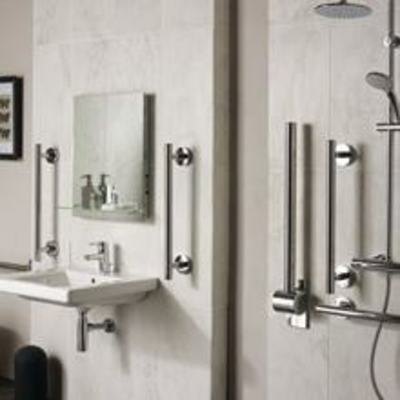 Those necessary helpful alterations and accessories no longer have to be unsightly intrusions; our refined contemporary chrome grab rails and accessories make a strong style statement.